Generates radial colored aura lines following the gradient of the source clip. 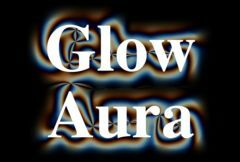 This is similar to GlowAura but here the glow colors are also scaled by the Mask input. Source: The input clip that determines the glow locations and directions. Threshold: Default rgb: [0 0 0]. Outer Brightnss: Default: 1, Range: 0 or greater.